Freshly sliced roast beef and 25 cent ice cream cones have helped Lion’s Choice restaurants gain a cult following—even if it’s only from St. Louis sandwich lovers. But there’s more to this regional roast beef restaurant than you may (never) have heard of. 1. LION'S CHOICE STARTED AS A BACKUP PLAN. Brothers-in-law Marv Gibbs and Clint Tobias, along with their friend Arthur Morey, planned the first Lion’s Choice restaurant in 1966. All three men were St. Louis, Mo., natives, and attended college in the area—it makes sense that their first restaurant wouldn’t be far from the Gateway Arch. During the 1960s, Gibbs worked as a chemical engineer for the St. Louis-based Monsanto research company, but worried that the company would go out of business. He developed his plan B with his brother-in-law, Tobias, and invited mutual friend Morey to help launch the roast beef, fast-food restaurant. As it turns out, Monsanto remained steady, and Gibbs continued to work full-time (occasionally cooking fries on the weekend) while Tobias managed restaurant operations. Morey was eventually bought out and left the St. Louis chain. 2. SELLING ROAST BEEF SEEMED EASIER THAN SELLING HAMBURGERS. In the mid-1960s, the burger market was flooded by giants like McDonalds and Burger King. “Trying to compete against the big boys, who had a lot more money, didn’t seem the way to go,” Gibbs said in 2013. At the time Lion’s Choice entered the roast beef market, its only competition was Arby’s, which opened two years before Lion’s Choice was even an idea. 3. THERE ARE A LOT OF NAMES FOR THE SAME ROAST BEEF. The first Lion’s Choice location opened its doors in 1967, but went by a different name: Brittany Beef. A second name, Red Lion Beef House, lasted a short time before the management trio discovered the name was already taken by a hotel chain. Lion’s Choice became the third and final pick, and was successfully used when the company expanded to a second location in 1969. 4. THE FIRST LOCATION IS STILL ROASTING AND SLICING. The original Lion’s Choice restaurant sits in the busy community of Ballwin, Mo., about 20 miles west of downtown St. Louis. After the chain began expanding in 1969, the first location remained operational, and continues to serve its “roasted beef”—what Lion’s Choice says is different than plain ole roast beef, because of how long the meat is prepared in-store. 5. ST. LOUISIANS EAT TONS OF ROAST BEEF. A well-visited Lion’s Choice location serves an estimated 60,000 pounds of roast beef annually, or about 5000 pounds per month. That’s the equivalent of 140 whole beef cows before you consider that the chain only uses one cut of meat for their sandwiches: top round roasts. With that in mind, it takes nearly 4000 beef cows to serve up a year’s worth of Lion’s Choice roast beef at one restaurant. 6. NOT FROM ST. LOUIS? SORRY, YOU'VE PROBABLY NEVER HEARD OF IT. If you thought Arby’s was the only roast beef restaurant, you probably live well outside of the St. Louis County region. The entire chain consists of 24 restaurants, with the furthest in Sullivan, Mo., about an hour from the original Lion’s Choice location. The chain held off on franchising until 2000, more than 30 years after its first sandwich sale. 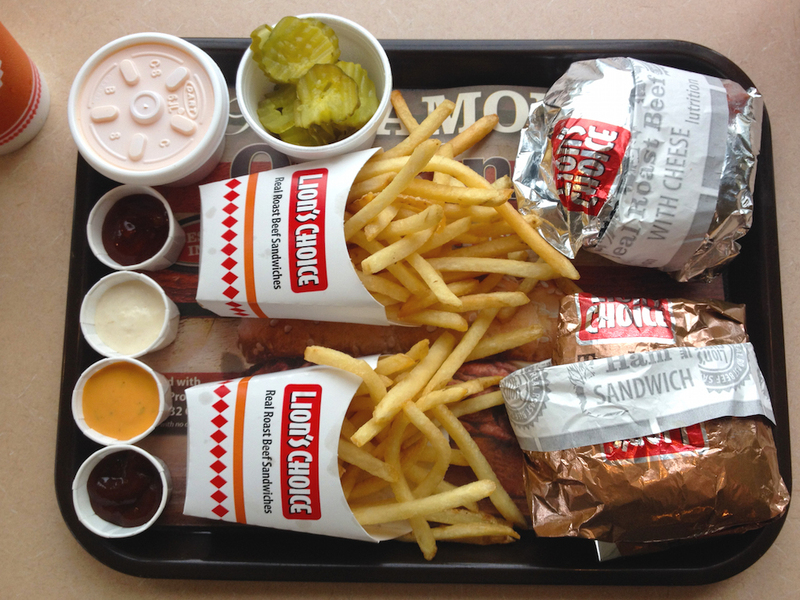 But that didn’t mean nationwide roast beef—all of those franchised restaurants are in St. Louis, too. 7. IT'S A SLOW-GROWING CHAIN. So slow, that Lion’s Choice took a decade-long hiatus on opening new locations. In July 2015, the chain opened its 24th restaurant in Ellisville, Mo.—the first in 10 years. Arby’s, which is considered Lion’s Choice's top competitor, has 42 restaurants in the same area. But plans for new growth are slowly on the roll. Gibbs and Tobias sold the Lion’s Choice chain to investors from—you guessed it—St. Louis in 2013. New owner Mark Disper said there are plans for the company to keep growing in the Show Me State, but that the chain will "look at different markets in the Midwest." Roast beef lovers, rejoice! 8. THE OWNER'S DAD CAN'T GET A FREE MEAL. Disper and his family have a long history with Lion’s Choice. He ate at the restaurant as a teen, and was the sandwich shops’ first franchisee. But that level of dedication to roast beef doesn’t mean his family gets free food. Even Disper’s Lion’s Choice-loving dad has to pay for his own meals. "I’m not gonna give him any freebies," he said in 2013. 9. 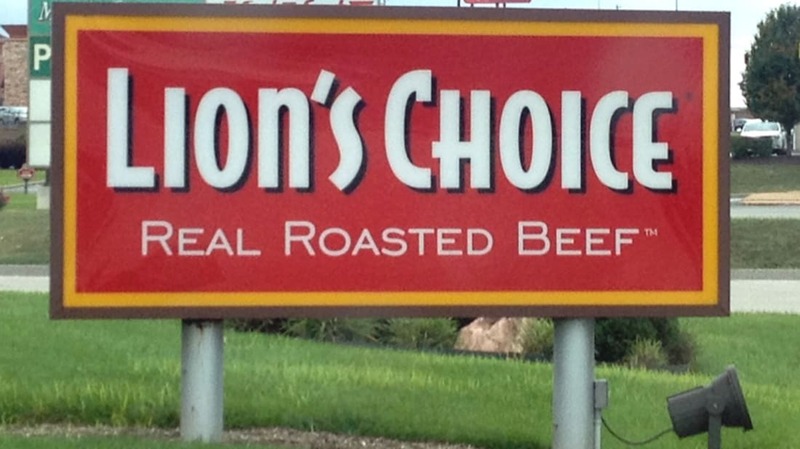 THERE'S UNOFFICIAL "BEEF" BETWEEN LION'S CHOICE AND ARBY'S. 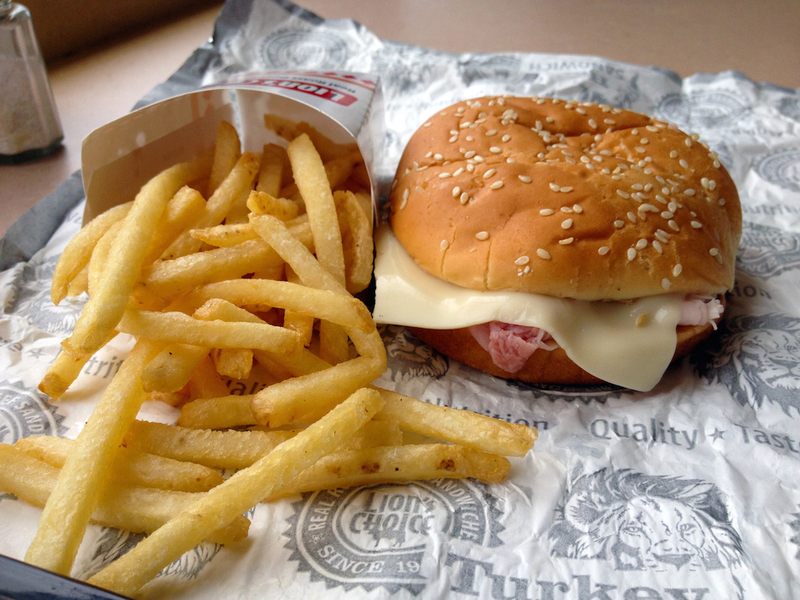 Few restaurants serve up fast-food roast beef, meaning Lion’s Choice and Arby’s are natural competitors. Arby’s opened shop three years before Lion’s Choice, in 1964, and in subsequent years has opened more than 3200 restaurants throughout the country. And while Lion’s Choice is sometimes accused of being too expensive or overly-seasoned, Arby's has to deal with that rumor about liquid meat that keeps circulating. Even though food review websites suggest trying both, it’s hard for roast beef aficionados to truly parse out which one is better because of how few Lion’s Choice restaurants there are. 10. A CUSTOMER'S SPECIALTY ORDER CREATED A TWITTER CRAZE. Holy Lion Size Me! Who's thinking #TomkoSpecial ( http://t.co/GiCrbo9 ) tweetup at one of our stores? 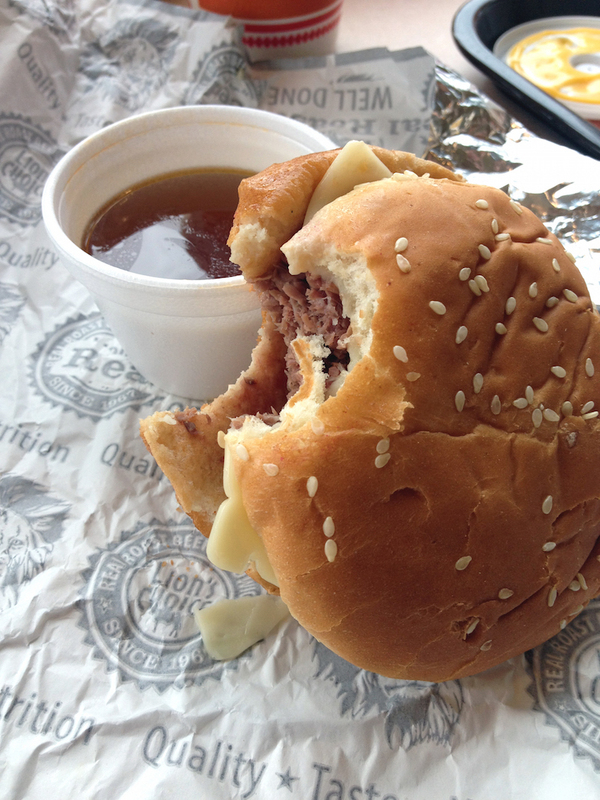 Lion’s Choice burgers are usually ordered plain, with extra seasoning or with a helping of melted cheese. But the restaurant’s sauce bars (complete with an au jus dispenser) are meant for customization to the max, like the #tomkospecial. In 2010, the secret of St. Louis resident Michael Tomko’s specialty order made it to Twitter: a large roast beef sandwich with extra seasoning, Swiss cheese, barbecue sauce and fries piled on top. Lion’s Choice shared the menu hack, and also considered planning a tweetup for #tomkospecial lovers to unite for lunch. Who knew roast beef could be the best way to make new friends? All photos by Nicole Garner.